Do Some Damage: Why Did I Write LOST CITY? 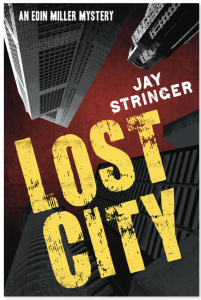 Why Did I Write LOST CITY? Lost City is out now. Right the hell now. You see that? It's at 1.99 on Kindle in the UK and some kinda dollar thing in the US. Okay, so it's out. But why did I write it? That's easy. I had a contract. I'm kidding. But just once, wouldn't you love to see an author saying that? In all seriousness, Lost City is the end of something I started a long time ago. Once I new Old Gold was going to be a book, and not just a monstrously long short story, I decided to see how far I could push it. I loved Lawrence Block's Matt Scudder series, and closer to home I was also impressed by what Ray Banks was doing with Cal Innes. These were characters in crime novels, but the world they inhabited bordered on ours. And I'm not talking in terms of street names and landmarks. The worlds that Scudder and Innes lived in had a cumulative effect on the people living in them. Scudder drank and became an alcoholic (or drank because he was an alcoholic) and we watched him drift out the edge of life and then pull himself back again, it by bit. Innes was a half-arsed PI who knew all about PI fiction. He also has a knack for getting beat up, blown up, or thrown from moving vans. In many fictional worlds, these are things you can shrug off. But for Scudder and Innes, these were things that stayed with them, that wore at them and ate away at their health and sanity. So once I knew that Eoin Miller wasn't going to die at the end of Old Gold (no spoiler tags needed, surely, it's a trilogy) I decided to go all out. Miller was going to have a story with a beginning, a middle and an end. I'm an atheist, and so I'll usually say I don't believe in the existence of the 'soul.' But I'm also a writer, which means some part of me must believe in some kind of soul, because I spend so much time searching it. Not in any real sense, but in that way that we all return to the blank page each time to try and find that thing. And I wondered, how lost could I make Miller? How far could I get him from his home, his family and his heart, and then -the real trick, like the final turn of a magic act- could I bring him back? How lost do you have to be, before you can no longer find your way back? And can crime fiction be the venue for telling a comeback story, or would I have to pull the rug out from under him at the end and have him die, or worse? I spent a trilogy trying to figure that out. There's really only one way for you to find out. Well put, and thanks for confirming my initial impression. I bought Runaway Town last week when I saw Lost City was coming out because I thought this might be a series best read in order. It's Dave, man. Open up.